My tummy is all of a flutter. Excitement and nerves rolled into one. I’m off on a girlie (NO KIDS) trip to Pisa. Clothes, bags, biscotti, and a tower that leans. Culture and freedom. I know my kids will be fine, but I feel guilty. I know they’ll miss me. The guilt nibbles away at my freedom. I won’t be there to tuck them up and say that I love them. They’ll go to bed without a good night kiss from mummy. So I found the perfect way to tell my kids that I love them from 2000 miles away. I ‘invented’ the good night kiss when I went away for a couple of nights with some old school friends to celebrate our birthdays (I won’t tell you which. Let’s just leave it at ‘getting older’!) I did feel bad at not being able to say good night to my babies, read them a bed time story and tuck them up safely. But you know what? I need mummy time too so I didn’t let myself feel guilty for too long. Instead I left little kisses on their pillows for them to find when they went to bed. They found them and treasured them and knew that I loved them even though I wasn’t there. Now I’ve started working two days a week and one night a week I don’t get home until they’re all tucked up and sleeping soundly. I often leave them a little kiss. A couple of weeks ago they even went away with school for a night. They had an awesome time and finding a little good night kiss from mummy tucked into their sleeping bags reminded them that I loved them and was giving them a good night kiss. How to Make Love Hearts for your Children. They only take a couple of minutes to make. 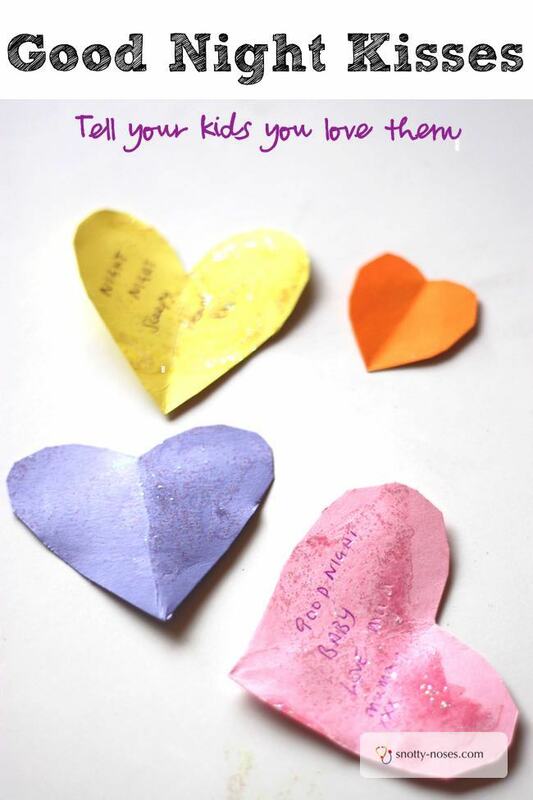 I cut out a heart (fold a piece of paper in half and cut out half the heart as in the photo), write a note and sometimes add a few drops of glitter glue. 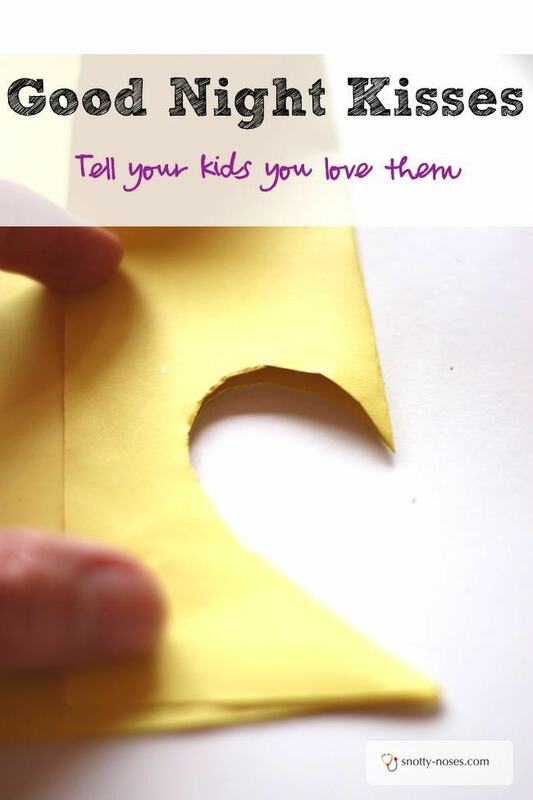 They’re such an easy way to remind your kids that you love them. What about Good Morning Kisses? They don’t have to be good night kisses. If you leave before they get up, they could be “good morning kisses”. Or what about “lunch box kisses”. 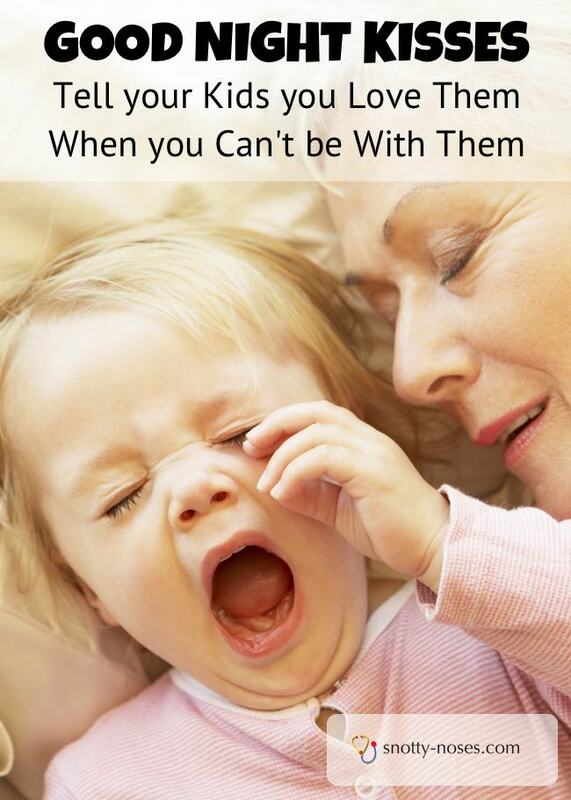 You can use them any time that you aren’t there and you want them to remember that you love them. My kids are now so keen on Good Night Kisses that we use them even when I'm at home as a reward for good behaviour at bed time. They have to be super good though! I suspect that my mummy guilt will never truly go when I’m not there to give them an actual good night kiss. But I can tell them that I love them and am thinking of them. I can wish them good night and sweet dreams. Good night my babies, I love you.